Let’s ring in the New Year with WALLPAPER! It’s coming back with bold colors and beautiful patterns. If you’re a renter, like many of us, no need to worry you can still join in on the fun! 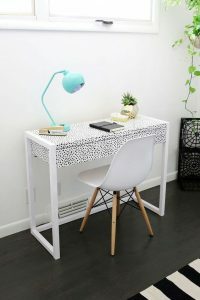 Desk or Vanity Table: Removable wallpaper is great for desks or vanities that need a pop of personality. 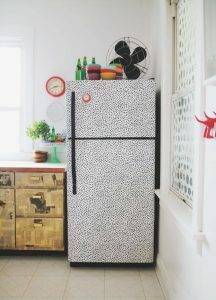 Refrigerator: Apartment kitchens are often dull and boring, but you can spice up your fridge using removable wallpaper. Whether it’s a solid burst of color or a retro pattern, your kitchen will look hip as ever. 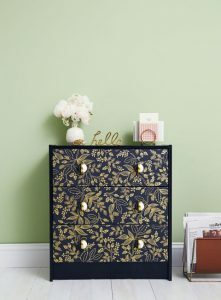 Dressers: Turn your plain old dresser into a fancy one! Line the interior and exterior with adhesive wallpaper. 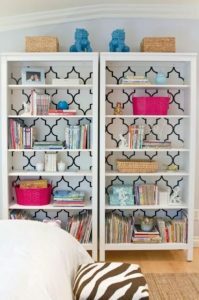 Bookcase: Bookcases are the perfect thing to wallpaper because they already take up a majority of wall space, so adding color and patterns is like enhancing your wall without all that messy paint. 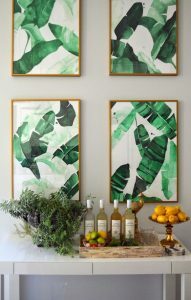 Framed Wallpaper: Can’t decide what you want to cover with wallpaper? Try framing samples. Gather a few samples of wallpaper that compliment your space and frame them! It’s an easy and affordable way to add charm to your home.